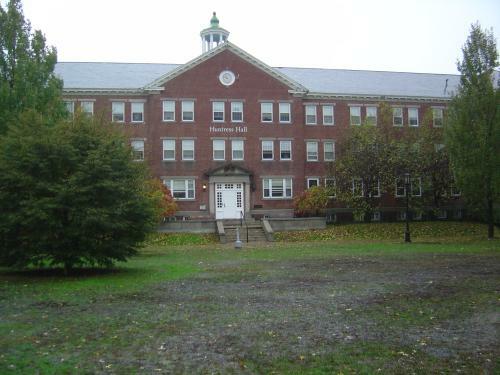 This is what the campus of Keene State College looked like yesterday, when day-long rains turned the quad in front of Huntress Hall into a sloshy swamp. Huntress is presumably haunted, but these days it isn’t ghosts that disturb my dreams but the seemingly ceaseless sound of raindrops and the possible floods they presage. With all the rain and flood-warnings we’ve had here in the Monadnock region over the past few weeks, I’m starting to think we’re suffering Post Torrential Stress Disorder. In the antediluvian days, I used to enjoy the sound of raindrops on windows: there was nothing cozier than the thought of curling up in bed with a book while wet weather raged outside. These days, though, my stomach sinks when I hear the sound of rain. Even though my house was spared the worst of the flood damage, I find myself worrying that my luck won’t hold: what if the cellar floods? What if the furnace fails? How can I curl up in bed with a book if I lose my heat, hot water, and power (again)? Although most of Keene has recovered from the worst of the flooding, I still hear from my porch the sound of pump motors and gurgling water-tubes from neighbors’ basements: no sooner do their cellars start to drain but another round of rain begins, filling basements like wells. Over two weeks after the flood, I’ve grown accustomed to seeing drenched piles of belongings along curbsides and filled Dumpsters in neighbors’ yards as clean-up continues to continue. Long after my landlord drained my cellar, yellow-jacketed Disaster Relief crews still frequent nearby houses where the fight against damp, mold, and mildew is not yet over…and in today’s newspaper, there’s grisly news of another sort of clean-up as the bodies of missing residents are being gradually recovered among wayward flood debris. In light of these reminders of the real toll of our recent floods, it seems petty to complain about smaller losses, but complain I shall. With so many rainy and overcast days, it’s been all but impossible to take decent pictures, light being my favorite photographic effect. Coming during a warm year when the changing leaves were behind schedule, weeks worth of rain and wind have stripped much of the usual autumnal color before we had a chance to enjoy it, meaning that the ground under trees is often more colorful than the trees themselves. And yet, in the midst of such rain-drenched despair, yesterday I happened upon an odd, out-of-place thing: a bright, cheeringly child-like painting left on a window sill in the Student Center at Keene State College, accompanied by a motivational note. 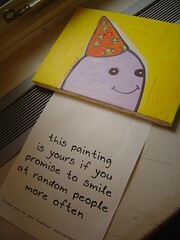 Although I didn’t take this freely offered painting, having no need for additional art in my home and feeling that someone else might need more than me a reminder to smile at random people more often, I smiled to think that Bren Bataclan (or one of his minions) had ventured all the way to Keene to share some post-flood love from his Smile Boston Project. (Click here for a larger version.) Yes, we need more than just an occasional ray of light here in southwest New Hampshire: yes, we need the hope that only a smile (or a painting traded for the promise of a smile) can bring. This morning, the rain has stopped here in Keene, and although everything is still soaked and soggy, we just might make it through October after all. If you’re a writer and something other than the weather has got you down, there’s still time to register for next week’s Move That Boulder tele-group, a free virtual workshop for writers facing daunting projects. So if you’re burdened with an unwritten dissertation, novel, proposal, story, or other troublesome writing project, click here for more details, including registration information. Enjoy! Beautiful fall pictures Lorianne, my favourite! I’m sorry to hear that there is still the problem with flooding there. I truly hope the rains stop soon, and the sun shines brightly on what is left of your autumnal beauty! The lack of light due to rain and clouds does not seemed to have deterred your photographic abilities! 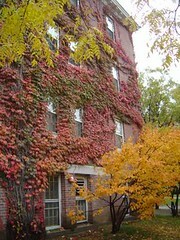 I love the photo of the red vine-covered wall. Hope your rain stops and some nice fallish weather soothes you before winter comes in earnest. We could use some of that rain, but I guess you can’t send it down here. 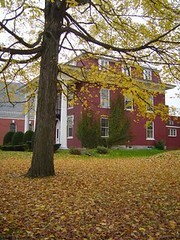 The colours of fall pictures is gorgeous! 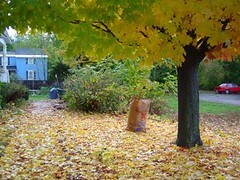 I love the bulk of leaves on the ground! About winter, come to visit Brazil and joy the hot weather! You are welcome to Enseada Azul!